Here is one of my favorite encyclias. 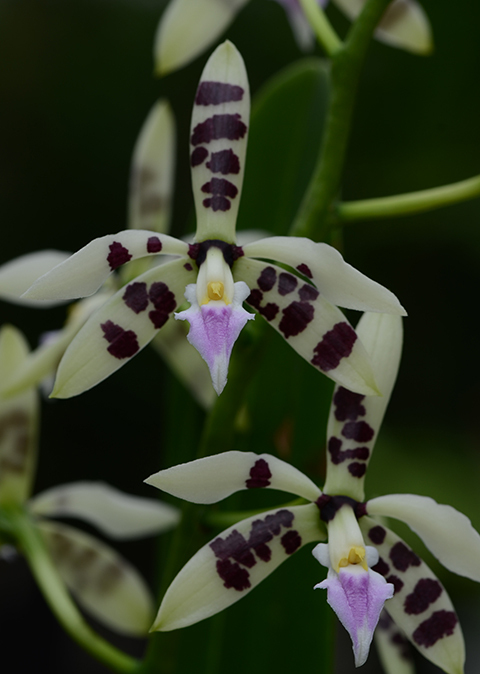 Encyclia prismatocarpa grows as an epiphyte from Mexico through Central America at 1200 to 2500 meters. I love the leopard spots on the petals and sepals. Until recently our plants grew well in our intermediate greenhouse, but with the trend toward warmer summers, they seem to prefer the Tropical High Elevation House, where the daytime temperatures stay below 77º. We were pleased to acquire the plant pictured above, an especially vivid color form, from Andy's Orchids this spring. It is flowering this week in a pot in the Orchid Display House. After flowering we will install it in the High Elevation House. A terrific orchid!